COME PLAY WITH US … VISITORS ALWAYS WELCOME! 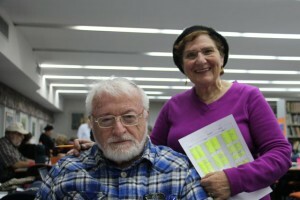 The minds of Steve and Liran were clearly deep in the calendar at the Club this week –- though not the same calendar that has much of Israel scrubbing its kitchens and stockpiling matza. With this week’s session sandwiched (bad pun….) between Palm and Easter Sundays, PENITENTS and CRUCIFY both found their way onto their board. § Alice and Yaakov were more multi-faith: with food and wine being a feature of both celebrations, they played FRIDGE, ZIN (Zinfandel) and, well, PUTRID. § And Chani and Rita gave each festival its nod with BRINIEST (think, eggs in saltwater) and PORKIEST (tasty Easter menu). § THE CLUB WILL NOT BE MEETING NEXT WEEK, during the Pesach holiday. The break comes at a cliff-edge. We’ve just played the 24th of Season 73’s 25 weeks. Playoff contestants are shaping up, relegations and promotions are emerging….. All will be decided next time we meet on April 30… Welcome to visitor Joyce Solomon of Canada….. Meantime, a happy Pesach to all our members and players.